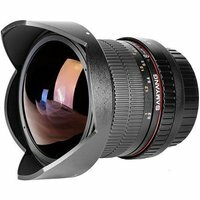 The Samyang 8mm f/3.5 UMC Fish-eye CS II is a wide-angle fisheye lens designed for compact system camers with an APS-C sensor. Its optics comprise of 10 lens elements arranged in 7 groups. The product's optical parameters are extremely high, thanks to the hybrid aspherical element and multi-layered anti-reflection UMC coatings. The lens provides a diagonal field of view equal to 180 degrees, while the minimum focusing distance is only 0.3 meters. The lens is fitted with a removable lens hood.